Plot: Two sets of wealthy parents meet for dinner to decide what to do about a crime their sons have committed. Starring: Michael Chernus, Taylor Rae Almonte, Steve Coogan, Charlie Plummer. 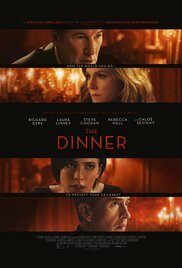 distributed by The Orchard «The Dinner» in the US movie theaters released on May 5, 2017 and has grossed over $1 million worldwide; dvd and blu-ray release date was set for August 8, 2017. Rent from Netflix and Redbox from August 8, 2017. «The Dinner» in the UK released in movie theaters on December 8, 2017. The movie estimated to release on dvd and blu-ray some time in March or April 2018.